The 21st century has witnessed a significant revival of interest in the ideas of Karl Marx among both the general public and left-leaning academics. No doubt this reflects a desire among many to examine solutions from the greatest and best-known critic of the system to capitalism’s recurrent bouts of economic contraction and social polarisation. There has been a notable lack of concomitant interest, however, in one of the few figures within the Marxist canon who can rival the founder for breadth and depth of analysis. The Hungarian scholar, Tamas Krausz, sets out to rectify that discrepancy in his ambitious and suitably titled volume, Reconstructing Lenin. Krausz perceptively notes that the academic neglect of the architect of the world’s first workers’ state, in notable contrast with the fashionable interest in Marx, is not primarily due to a lack of substantive theorising in the work of the former. There is essentially a political agenda to the downgrading of Lenin: ‘Marx’s philosophical and economic achievements may continue to exist apart from any revolutionary workers’ achievement-but not Lenin’s’ (359). In other words, the bourgeois academy has become increasingly adept at sanitising Marx and presenting him as an interesting, albeit eccentric, radical commentator. No such intellectual neutering is possible with Lenin as his analyses and ruminations are always tightly integrated with the revolutionary project of smashing the system. Lenin cannot be made safe for students to the same extent as is possible with Marx. As Krausz puts it: ‘Lenin’s ideas philosophically resist fragmentation or segmentation by discipline … All its constituent elements point toward the totality, the indivisible process’ (358). Krausz is not the first contemporary scholar to argue Lenin’s legacy is overdue for a re-evaluation from both leftist scholars and the broader anti-capitalist movement. Others such as Lars Lih, Paul Le Blanc and August Nimitz have recently articulated cogent cases for revisiting Levin’s output and utilising the strategic insights contained within for the benefit of the socialist project in our time. Krausz argues that Levin’s credentials should actually make him the starting point for any debate on the way forward for the left: ‘The main reason for this is that the Leninist tradition of Marxism is the only one that has offered, at least for a time, an alternative to capitalism. It alone made a breach in the walls of capitalism, even if today that breach seems mended’ (356). The author notes that the widespread notion that the Leninist paradigm is irrelevant to contemporary struggles is the long-term consequence of the ossification and distortion of the Soviet’s leader thought that emerged soon after his death in 1924. In the USSR, ‘Leninism’ became the moniker for a rigid and doctrinaire system that was used to justify the cynical twists and turns of the Stalinist regime that gripped the country till its collapse in the 1990s. In the West, Lenin was portrayed by conservatives – and some on the left –as laying the foundations for that regime and as morally complicit in its despotic nature. Krausz is scornful of the superficiality of both these caricatures and instead takes explicit inspiration from a defence of Leninism articulated by his compatriot, Georg Lukács, in the 1920s (472). Even some of Lenin’s supporters on the modern left have argued that the term ‘Leninism’ should be jettisoned as it has a toxic flavour that deters potential adherents. Krausz rejects such a view and, with formidable scholarship and powerful argumentation, constructs a case for the retention of the term and its key tenets. The caricature of Lenin that served the interests of ruling elites on both sides of the Berlin Wall for decades was partly constructed on the image of a machine-like personality, stripped of ordinary human sensibilities and regarded as infallible by his followers. Krausz opens his study with a biographical overview of Lenin’s life and career that blows aside these myths and humanises the revolutionary leader as a remarkable human being, but a human being nonetheless. 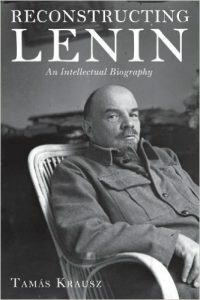 Lenin’s life became so dedicated to the revolutionary cause that it seems strange to think of him working in any other vocation but Krausz reminds us that Lenin ran a legal practice in the early 1890s and succeeded in each of his twenty four cases in getting the accused a reduced sentence (36). His legal brilliance was founded not just on a perspicacious intellect but also on an idealism that never left him. Krausz observes, ‘his guiding principles were social, guided by ethical laws and formed all of his decisions from the perspective of the economically downtrodden’ (37). He loved Tolstoy’s Anna Karenina so much that he read it at least one hundred times (59). On the legendary sealed train that took Lenin and a small group back to Russia in 1917, he interspersed writing theoretical tracts with boisterous singing of revolutionary songs (467). When his comrade and lover, Inessa Armand, died in 1920 Lenin broke down and wept at her funeral (466). He took particular pride in the legislation that made the Soviet state the first in the world to ban the criminalisation of homosexuality (71). As for the notion of Lenin as the uncontested authority within the Bolshevik Party, Krausz outlines numerous occasions when his subject was openly challenged by the rest of the leadership; most critically when the sealed train arrived in Petrograd and the notion of overthrowing the Provisional government was rejected by most of the party hierarchy (65). On an earlier occasion, Lenin found himself in a minority of one after being outvoted on the question of participation in the tsarist Duma (486). Krausz is not oblivious to Lenin’s personal foibles and observes he ‘was hardly the best judge of human character’, frequently attaching misplaced trust in individuals (61). The author does not glide over Lenin’s political misjudgements either, including a substantial analysis of the abortive Soviet invasion of Poland in 1920 in which he argues his subject ‘underestimated the strength of peasant patriotism, national feeling, nationalism and sense of dedication to the new Polish nation state’(300). Having restored a sense of Lenin’s humanity and fallibility that has been denuded in East and West, Krausz undertakes an impassioned defence of the Russian leader’s seminal contributions to Marxist strategy and tactics, commencing with an assessment of how Lenin broke with the Second International orthodoxy that proletarian revolution was only feasible in the fully developed capitalisms of Western Europe or North America. The author recounts how one of the first theoretical acts of Lenin’s revolutionary career was to break with the Narodnik perspective that had tragically led his brother, Alexander, to an appointment with the hangman’s noose. Narodism was the theory that nineteenth century Russia’s predominantly agrarian economy entailed the country could feasibly skip the capitalist stage of development and that the peasantry could be the social basis of an indigenous socialism. Lenin’s empirical investigations in the 1890s persuaded him that this perspective underestimated the extent of the penetration of capitalist social relations in the countryside and that the small but growing urban working class was, in fact, the key to revolutionary change. He also discerned the strategic significance of the country’s increasing integration with the more advanced economies of the West. Krausz encapsulates the nature of Lenin’s insight at the turn of the twentieth century: ‘Russia was embedded in the global economy … with its pre-capitalist forms preserved as enclosures under capitalism in order to reinforce a subordination that was among other things quite suitable to Western capitalist interests’ (88). This economic analysis, in turn, led Lenin to the political prognosis that Russia’s idiosyncratic fusion of unfolding industrial dynamism with an antiquated political superstructure made it a weak link in the chain of global imperialism, and therefore vulnerable to a revolutionary socialist movement. Krausz awards credit to Lenin for perceiving the strategic significance of the relationship between core and peripheral states long before much later thinkers such as Immanuel Wallerstein focused on the issue (363). Analysing the character of a revolutionary movement to challenge the tsarist-capitalist hybrid led Lenin to formulate his most pivotal contribution to Marxist politics – the concept of the vanguard party. This was most systematically outlined in his 1902 pamphlet, ‘What is to be Done?’ Again, Krausz underlines that it is essential to strip away the misconceptions that have accumulated around this text: ‘Lenin cannot be blamed that during the Stalinist period the work was essentially canonised for the sake of ensuring the leading role of the party and consolidating party discipline. Taken out of historical context … its intent and purpose were generally falsified’ (112-3). The author persuasively argues that this influential study has been wilfully distorted by elites in the East and West, for differing reasons, but with the common line that Lenin was dismissive of the potential for revolutionary consciousness among workers and believed that only an intellectual clique could impute such awareness from without. The author offers an alternative interpretation that Lenin was simply observing the truism that under capitalism most workers, most of the time, do not discern the operation of the system due to a combination of the effects of alienation, the separation of the economic and the political, and the coercive power of the boss. However, a minority of employees do manage to see through the smokescreen of ideology and this group, alongside class conscious activists, should form the basis of a vanguard. The crucial point for Krausz is that Lenin’s revolutionary party does not exist separate from the class, but acts on the basis of a dialectical interaction with it. As the author puts it, ‘the historical role of the party is to function as the leader and catalyst of a movement already in existence … and that it strives to incorporate all progressive and revolutionary elements as mentioned in the Communist Manifesto’ (113, 118). The stereotype of an exclusive clique of professional revolutionaries propagated by the myth-makers of East and West is supplanted by the more appealing notion of a sizeable group of like-minded activists and workers seeking to channel class struggles along an effective path to challenging the system. This revised model of the Leninist party can arguably be made relevant in the context of the 21st century when we have seen broad coalitions of the left emerge in Europe such as Syriza in Greece or the Radical Independence Campaign in Scotland. Revolutionaries operating within or alongside these types of formations can feasibly facilitate the dialectical interaction discussed by Lenin and Krausz, operating as a left-wing pole of attraction for militants. The latter is keen to stress that however we should interpret the model of the party in ‘What is to be Done?’ it represented only one of a number of organisational perspectives that Lenin was prepared to consider throughout his career. As mentioned above, he found himself at odds with others in the Bolshevik party a few years after writing this text over the question of participation in the Duma, the tsarist parliament. For Lenin, the question of electing left-wing representatives to such a body or not was never an abstract matter of principle but always a question of whether such people would help or hinder the propagation of socialist propaganda. At times of revolutionary upsurge they would be an irrelevance but when the class struggle was at low ebb they had a role to play in terms of sustaining the voice of opposition. A fellow revolutionary neatly expressed the mature of Lenin’s tactical brilliance, comparing it to ‘the art of the good chess player, placing the right piece in the right place at the right time to win the match’ (137). Likewise this principled flexibility meant that Lenin supported the convening of the Constituent Assembly before the October Revolution but once the latter had occurred such a body became obsolete .Krausz justifies this controversial move on the basis that the Assembly personified the ancien regime and that its dispersion was mourned only by the elite: ‘Few could understand its function-it reminded most people only of the old gentleman of the past regime-in contrast to the soviets which were seen as the people’s organisations’ (216).In terms of the parliaments of the West, another of Lenin’s key texts, ‘Left Wing Communism’, advised revolutionaries outside Russia in the 1920s to avoid the wilderness of sectarianism and to participate in the institutions of bourgeois democracy, including trade unions, again with an awareness of the opportunity such bodies provide to engender a dialectical interaction with the masses. As Krausz explains, ‘Lenin was scornful of traditions that suggest or urge revolutionary action in nonrevolutionary situations. He recognised and emphasised the need for a flexible politics suitable to the reigning political situation that is a politics that appreciates the significance of compromise’ (309). It may strike some as counter-intuitive to associate this last word with Lenin but Krausz powerfully argues that the reason the Russian leader is one of a small group of Marxist theoreticians to have actually led a successful revolution is that he had a sure grasp of when to practise compromise and when to avoid it. An inability to perceive such situations has plagued the far left for generations, leading many to wither away in what Krausz refers to as ‘messianic leftism’ (304). One of the few weaknesses of Krausz’ account is an underdeveloped explanation of why that revolution in Russia ultimately degenerated, but overall the author constructs a compelling case for the relevance of Leninism in our time. In this decade alone we have witnessing mobilisations against the system on a gigantic scale in countries such as Brazil, Egypt and Turkey but none so far have managed to punch a hole in the armour-plating of the capitalist state. The author contends a renewed version of Leninism could supply such an emancipatory force as this is a body of ideas that ‘provides tools for those who still think of the possibility of another, more humane world’ (370).